Posted on August 1, 2018 at 2:20 pm. 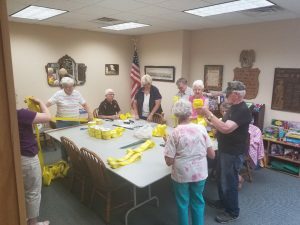 Huge thanks to the crew who made yellow ribbons for the Yellow Ribbon Ceremony Project. We could not have done it without Toodie Bonk, Linda Clark, Carol Oryszczyn, Art & Jane Petersen, Art & Alice Feldman, and Joan Amacher!